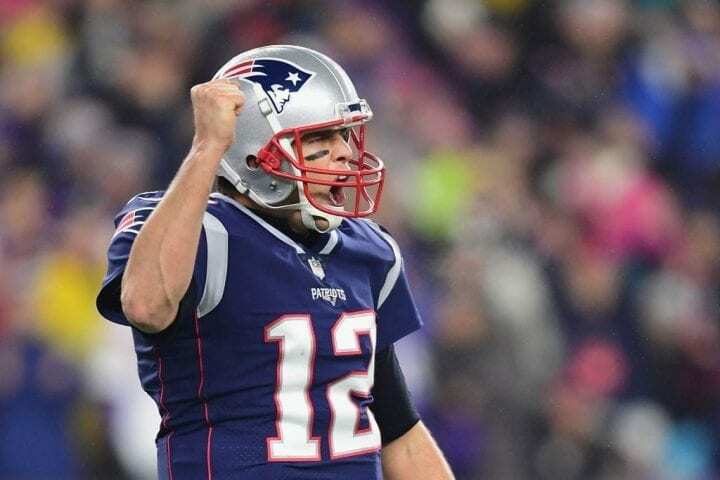 This might surprise you, but Tiebreaker.com considers the New England Patriots the best team in the AFC. Tom Brady now has 1,000 rushing yards and that was the deciding factor. The Patriots began the season 1-2. Many thought the body was floating in Boston Harbor. Hah! They have won eight of nine are dominating the AFC East and may be hosting a playoff game again. You want to know what Patriots are all about? Fullback James Develin, a Brown man, scored two touchdowns against the Minnesota Vikings last week. He gained five yards on four carries. This season, he has three TDs and six yards on five carries. Role players, my friends. The Chiefs did not demolish the Oakland Raiders in quite the way you might have expected. It was an orderly, businesslike win after an extraordinarily upsetting week during which they dumped their top halfback, Kareem Hunt, after the release of a video showing him striking a woman. Without Hunt, Pat Mahomes turned to tight end Travis Kelce (12 catches, 168 yards). But this team’s defense still stinks and sooner or later that’s going to be a big problem. Their remarkable turnaround now includes nine straight wins after an 0-3 start. They can clinch the mediocre AFC South on Sunday, but that’s now considered an inevitability instead of a miracle. We continue to heap praise on receiver DeAndre Hopkins, who now has 80 catches for 1,115 yards and is one of the best in the league. The dude has some serious ball skills. Every week, the Bolts give you something to appreciate. Two weeks ago, it was Philip Rivers, who completed his first 25 pass attempts. Last week, they fought back from a 16-point deficit (23-7) at the half to beat the Pittsburgh Steelers. They have a great offense, too. Only the Chiefs (86) have more rushing and passing plays exceeding 15 yards (run) and 20 (pass). We are beginning to think an LA-LA Super Bowl might happen. 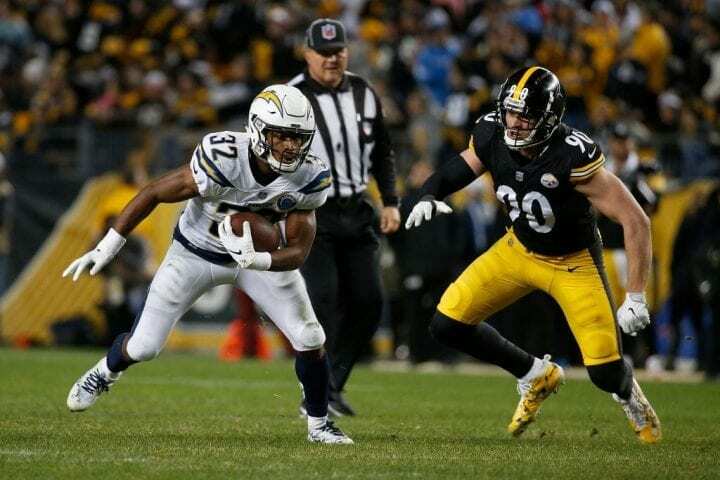 As you might suspect, the Steelers were not as happy about Sunday’s result as the Chargers were. The Steelers have lost two straight and at 7-4-1 have just a 1/2-game lead over the Baltimore Ravens in the AFC North. They still have to play the Patriots and Saints over the next three weeks. Their defense (39 sacks) can disrupt with best of them. But what are they going to do without halfback James Conner at Oakland on Sunday? Oh, wait a minute. It’s Oakland. Never mind. We admit, Floyd Little and Terrell Davis were spectacular, franchise icons. But what about this kid, Phillip Lindsay. He gained 157 yards rushing on Sunday, averaging 8.03 per carry. He is averaging 6.08 yards per carry this season, third most in the league since 1970. O.J. Simpson’s best only checked in at 6.03. Lindsay (937 yards) is on pace to gain 1,205 yards, which would break Dominic Rhodes 2001 mark (1,104) for undrafted rookies. Oh, the Broncos (6-6) have won three straight and are back in the Wild Card race. We know what you are thinking. How could the Colts, with Andrew Luck at QB, who had thrown at least three TD passes in eight straight games, and his team on the wings of a five-game winning streak, go to Jacksonville and lay an egg? Please note, an egg is shaped like a zero and emblematic of a 6-0 loss the organization (6-6) hopes will not quiet its playoff push. Even though we realize it’s not that hard to do, the Titans did come back from a 16-point deficit on Sunday to beat the New York Jets. Hey, who hasn’t embarrassed the Jets over the last few years? The thing is, the Titans are starting to score some points, averaging 31.3 over their last three games. They join the Colts, Dolphins and Broncos in 6-6 mosh pit. As will explain later, only a pair of bad hands prevented the the Fish from losing at home to the Buffalo Bills last Sunday. Let’s face it, if there is one thing the Dolphins have done consistently this season it’s win at home (5-1). This is a team that inspires little excitement, a 6-6 team if there ever was one. Well, at least the weather is nice in the winter. If you spent anytime hanging around Tom Coughlin when he coached the Jags and the New York Giants, you realized how important discipline was to him. He ran his teams in militarist fashion, precise on its angles, dressed to his specifications. We mention this because the Jags have reflected none of those ideals this season. They sneer and taunt and revel in personal fouls. Against the Colts, Jalen Ramsey, the clown king, extended his hand to a fallen Luck and then pulled it away as Luck reached for it. Enjoy 4-8 guys. You deserve it. Back to their game against the Dolphins. The Bills would have defeated the Fish in the final seconds had Charles (Hands Of) Clay not dropped a game-winning pass from Josh Allen. Making matters worse, Clay signed a five-year, $38 million deal with the Bills in 2015 to help insure against these situations. There was a rainbow, however. Allen, the rookie QB, gained 135 yards rushing and his offense outgained the Dolphins 415-175. You want a team of the future? Praise the Buffalo. While the Browns prepare to hire a new head coach – again – we offer a piece of advice. Find someone with a fertile offensive mind that can take Baker Mayfield to his expected level. Mayfield threw for 397 yards against the Texans, but he also tossed three INTs. Mayfield is excitable and passionate, but raw. The Browns have no need for raw right now. The Bengals lost their fourth straight last week to the Broncos. They lost starting QB Andy Dalton the week before and receiver A.J. Green on Sunday. Neither will play again this season. Not that it matters, of course. The Bengals have allowed 433.1 yards per game and it won’t be long before Marvin Lewis hands his company phone and laptop to human resources. Watching Todd Bowles get angry last reminded us of how Charlie Brown would act when Lucy got under his skin. Just like Lucy, Bowles’ players picked up the ball just as he was getting ready to kick it last Sunday, blowing that 16-point lead. Did you know that when Trumaine Johnson returned an interception for a TD in the first quarter, it was New York’s takeaway in five games, the longest streak of ineptness in league history. Our takeaway: Bowles should hang out with Snoopy, instead. If Derek Carr ends up playing QB for the Jaguars, Giants or Dolphins next season, please remember that he needs only 69 more passing yards to move into second place in franchise history (to Rich Gannon) in that category. It seems like Carr might be a good building block for a 2-10 team with three No. 1 draft picks in 2019.